(Phys.org) —A team of physicists working at the University of Erlangen-Nuernberg in Germany has built a working optical diametric drive. 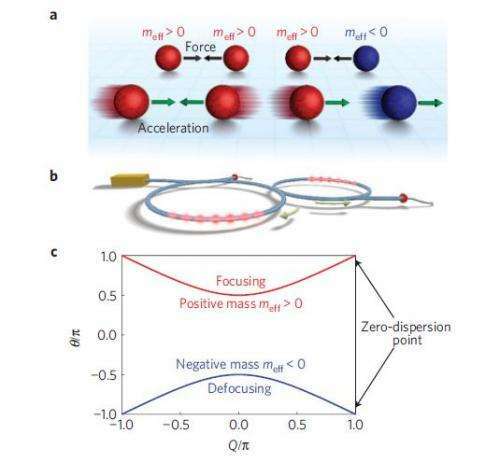 In their paper published in Nature Physics, the team describes how they built a two-loop structure that because one loop is longer than the other, works to create an effective mass resulting in a demonstrable optical diametric drive. A diametric drive is one where particles that run into one another are made to react by accelerating in the same direction—like balls on a pool table both accelerating in the same direction when made to run into one another—it's only theoretically possible if one of the balls has a negative mass. Scientists have toyed with the idea of diametric drives for quite some time, hoping to overcome the obvious limitation that it goes against Newton's third law of motion (every action must have an equal and opposite reaction). In this new effort, the team working in Germany hasn't violated Newton's law, but has found a way to make it appear as if they have. The team imagined an optical drive that allowed for photons running into each other to both accelerate in the same direction afterwards—a possibility because photons have no mass. Their idea relies on a property of photonics called effective mass—it comes about when photons travel through a material that slows its speed proportional to its mass. If some photons travel though such a material then join the rest of a pulse, interference will occur causing the original pulse to behave as if it has mass. The problem in creating a diametric drive using this technique is that any material used would have to be so long that it would absorb the light before the drive properties could be achieved. To overcome this problem, the team in Germany connected two fiber optic cable loops together (creating an infinitely long pathway) at a juncture point—with one longer than the other. Photons sent by a laser pulse take longer, of course, to travel around the longer loop, thus when they meet up with photons in the smaller loop, interference occurs, causing the photons to both accelerate in the same direction. The optical diametric drive doesn't have much practical purpose just yet, but further research into electronics that use fiber cables could result in faster communications, and thus faster networks. Newton's third law of motion is one of the pillars of classical physics. This fundamental principle states that the forces two bodies exert on each other are equal and opposite. Had the resulting accelerations been oriented in the same direction, this would have instead led to a counterintuitive phenomenon, that of diametric drive1. In such a hypothetical arrangement, two interacting particles constantly accelerate each other in the same direction through a violation of the action–reaction symmetry. Although in classical mechanics any realization of this process requires one of the two particles to have a negative mass and hence is strictly forbidden, it could nevertheless be feasible in periodic structures where the effective mass can also attain a negative sign. Here we report the first experimental observation of such diametric drive acceleration for pulses propagating in a nonlinear optical mesh lattice. The demonstrated reversal of action–reaction symmetry could enable altogether new possibilities for frequency conversion and pulse-steering applications. Effective mass means having behavior analogous to mass, but it is not a real mass. So it is not a surprise that it can break Newton's laws, but it doesn't mean that real mass also violate these laws - saying e.g. that if object with real mass accelerates in a medium, this medium gets opposite force. There are different types of mass, like rest energy released in annihilation, inertial in F=am law or gravitational in Newton's law. For such "diametric drive" they would need negative inertial mass, meaning: the stronger you push something, the stronger it accelerate toward you - it is a nonsense.